Last night Matt and I watched the Women's Gymnastics Team (we recorded it from Sunday night). The girls were so amazing! It reminded me of my gymnastics days...except for the fact that the only thing I could do was tumble. For one, I never mastered the "kip" on the uneven bars and wasn't very good at getting to the high bar without doing one leg at a time. I hardly ever stayed on the balance beam after a cartwheel, and sometimes even one full turn. On the vault my legs were bent the whole time. But at least I had my tumbling...even though my legs probably weren't straight either. My sisters and I all did gymnastics for several years and it was a big part of our life. We performed competitively with Cobb Challengers and then for our elementary school as well. My dad even set up a balance beam in our back yard, and we had a perfectly placed tree branch that served as our bar for practicing. When I watch those young girls on TV, it brings back memories of fun times with my sisters and friends. Of setting up the mat in the backyard and learning new flips. 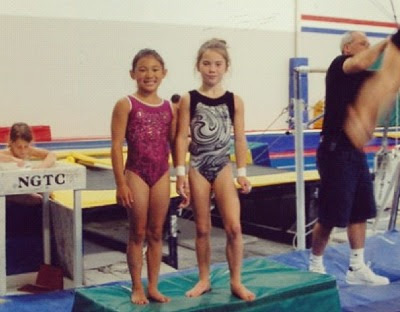 I remember my sisters helping me for hours trying to learn moves on the bar and beam. I remember the first time I got my back handspring (first grade) and my back flip (5th grade). 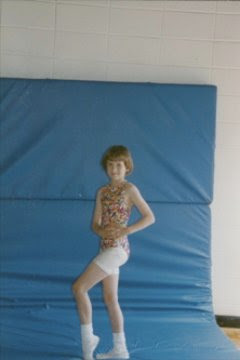 However, I'm also glad that gymnastics wasn't my whole life. I did other sports and hobbies all the time. It kinda makes me sad for some girls that so much of their life is spent in the gym. Maybe being in the Olympics makes all that sacrifice worth it. 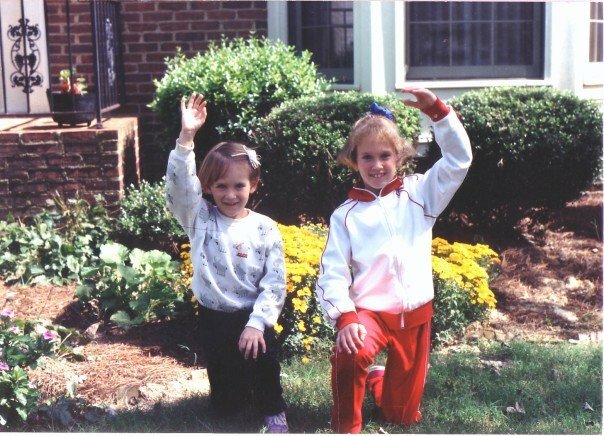 School gymnastics team, 2nd grade. Gotta love the spandex shorts under the leotard. 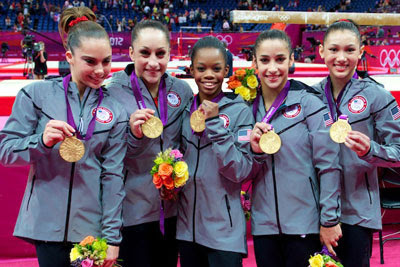 Gabby Douglas gets so high on the bars! We could have been teammates! Love the old school pics!